Sharon O’Neill – In 1979 CBS had their eye on a young singer/songwriter called Sharon O’Neill and released her first single ‘Luck’s On the Table’ from the album ‘This Heart, this Song’. 1980 saw the release of her second album which reached No3 on the charts – the album was self-titled and encrusted with the gems ‘Words’ & ‘Asian Paradise’. In 1980 Sharon released the Top 5 hit ‘Don’t Let Love Go’ with Jon Stevens. With encouragement from CBS Sharon recorded a song called ‘How Do You Talk to Boys’ – the first and last time during her career she recorded a song written by another writer. A support slot on a national Australian tour with Boz Scaggs gave her the exposure she needed and her single ‘Maybe’ reached No12 on the Australian charts. Her 3rd album Foreign Affairs was released in 1983 and the single ‘Maxine’ which had been recorded in LA was her next hit. Her partnership with Alan Mansfield who replaced Paul Hewson in Dragon spawned numerous songs for some of Australia’s top artists including Dragon. Sharon penned ‘Young Years’ among others. In 1987 Polydor signed her and released the ‘Danced in the Fire’ album. In 1990 Sharon recorded the album ‘Edge of Winter’ … then settled back to writing songs for others. Margaret Urlich – Margaret had phenomenal success with her debut album 'Safety in Numbers' in 1989. . New Zealand born Urlich saw her first album steadily build into a major hit on the Australian charts. By 1991, ‘Safety in Numbers’ had gained the singer three platinum albums in Australia and a No.1 platinum album and No1 single, ‘Escaping’, in her homeland. Her second album ‘Chameleon Dreams’ took Margaret to Los Angeles where she wrote two songs with Ian Prince one of the key contributors to Quincy Jones ‘Back On The Block’ project. Margaret completed the writing/production on the album with Tony Swain (best known for his work with Alison Moyet and Spandau Ballet). ‘Chameleon Dreams’ achieved Platinum Status in Australia and New Zealand. On her third offering ‘The Deepest Blue’ Margaret returned to her partnership with British writer/producer Robyn Smith. Then in 1998 the seeds were sown for what was to become Margaret Urlich's fourth album ‘Second Nature’. Murray Thom of ‘The Great NZ Songbook’ fame, having always been a staunch exponent of Margaret’s, released her fourth album ‘Second Nature’. With Eddie Rayner from Split Enz as producer this is an album of great songs written by great New Zealanders. Margaret Urlich is a serious songwriter/performer, with a touch of dance floor diva and is an enthralling live performer. Annie Crummer – Annie’s first single ‘Once or Twice’ at age 16 reached No16 on the charts. Her signature sound was cemented in NZ pop history on the Netherworld Dancing Toys No1 hit ‘For Today’. Annie’s first solo album ‘Language’ reached platinum status and spawned the No3 hit ‘See What Love Can Do’ recorded with Herbs. Her second album ‘Seventh Wave’ was mixed at Prince’s studio Paisley Park in the States. She has supported Ray Charles, KD Lang, Paul McCartney, Michael Jackson and Sting. More recently she had the female lead role of the Killer Queen in Queen’s ‘We Will Rock You’. Annie is currently releasing new material under the moniker annie.c. In the words of one of the greatest guitarists in the world, Brian May of Queen, she has ‘the voice of one in a million’. Debbie Harwood – After three solo releases Debbie Harwood formed the Kiwi phenomenon When the Cat's Away that in the late 80s was named ‘Top Group’ at the NZ Music Awards as well as celebrating a gold album and the No 1 single Melting Pot. Harwood also won 'Most Promising Female Vocalist' in 1985, ‘Most Promising Group’ in 1987 and was a finalist in the category of ‘Best Female Artist’ at the 2006 NZ Music Awards amongst other accolades. She sang on the official song for the Commonwealth Games in 1990 and then joined Jimmy Barnes' and Diesel's bands as backing vocalist and toured Australia extensively. Since 1996 Harwood has produced several albums (she was a finalist for 'Producer of the Year' at the NZ Music Awards for her album Peaches). When the Cat's Away toured and recorded again in 2001 and 2002 achieving Platinum sales for their live album with Sharon O'Neill and had yet another hit single with Asian Paradise. In 2004 Debbie recorded her critically acclaimed languid album Soothe Me and continues to write and record original material. Her latest single ‘Isolated’ will be released in September 2016. Jason Kerrison is a multi-platinum, multi-award winning singer-songwriter, producer, meditator, planetarian and wannabe surfer from New Zealand. In 2011, JK was made a Member of the New Zealand Order of Merit (MNZM) in the Queen's Birthday Honours, for Services to Music. JK has now released his first solo EP called ‘#JKEP1’. Jason describes it as eclectic stomp pop with acoustic framing and digital renderings. Produced to tickle the soul, speak to the heart and at times shake the hips. Tiki Taane is a dynamic and exciting singer/songwriter/MC/DJ whose live performances never fail to engage, from solo performances armed only with an acoustic guitar, to electrifying and powerful shows as front man for the epic group "Salmonella Dub". Tiki has earned the respect of both audiences and other artistes worldwide. If you were to look at the New Zealand music charts anytime in the mid-80s Kiwi band The Narcs were consistently riding high. In the golden age of touring bands, The Narcs filled pubs and concert halls, opened for overseas acts like Queen and Elton John, toured relentlessly up and down New Zealand and across Australia with bands like Dave Dobbyn’s DD Smash, Midnight Oil, Cold Chisel and Split Enz and were in the vanguard of bands who made music video hip. The Narcs’ big year was 1984 when they stormed the New Zealand Music Awards broadcast nationwide from Wellington’s Michael Fowler Centre and owned the night claiming 5 RIANZ music awards on the back of the release of their album “The Great Divide” and the single “(You Took Me) Heart and Soul”. A CBS record deal at the time saw “Heart and Soul” released in 9 countries around the world. Apart from Split Enz no other New Zealand band had achieved a global reach before the rise of the internet. The band started as a 3 piece in Christchurch in 1980, scoring a residency at Doodles Night club in Christchurch. It wasn’t long before their hard-edged Australasian rock had The Narcs ﬁlling Friday & Saturday nights at the likes of the Hillsborough Tavern and Aranui Hotel. Their ﬁrst recordings “First Chance To Dance”, Here She Comes”, “Over My Head”, “Stay Away” and “No Turning Back” helped deﬁne the Kiwi pub rock sound which ﬂowered with the rise of Hello Sailor, DD Smash, The Exponents and Pop Mechanics. The mainstay trio of Andy Dickson (guitar, lead vocal), Tony Waine (bass) and Steve Clarkson (drums) moved from Christchurch and were joined in Auckland by keyboardist Liam Ryan. The band had a slew of radio and video hits including “(You Took Me) Heart and Soul”, “Lazy Susan”, “Diamonds on China”, “Abandoned By Love”, “Missing In Action” and “It’s Got To Be Love”. The Narcs’ legacy includes two EP’s, several singles, a shared live album with Coconut Rough, three studio albums – “The Great Divide” (1984), “The Narcs” (1986) and “Push The Boat Out” (1996), The band had a reputation for highly successful national tours and dynamic live performances. The Narcs returned to the live concert scene playing at Mills Reef Winery in 2014 and then in 2016 with more spirit than ever, featuring guest drummer Peter (Rooda) Warren of DD Smash performing to a rousing response along with Mental As Anything at the SnapaRock concert at Nelson’s SnapaFest 2016. Shorrock, the founding frontman of ‘70s hitmakers Little River Band (later known as LRB) , The Twilights and Axiom, has carved out an astonishing career around the globe and in particular the U.S., where LRB shifted the bulk of its 25 million-plus career album sales. The living legend has the unusual distinction of having been inducted into the ARIA Hall of Fame on two occasions, both as a member of LRB, and as a solo artist. The veteran singer isn’t caught reminiscing on “Rise Again,” a collection of new songs from different writers. It’s a textured reflection of a mature, evolving artist who has enjoyed the rare sight from the summit of showbiz. Available with a full live band (Glenn + 5 musicians) for a full concert-length show of 60-90 minutes or 'unplugged' with two acoustic guitarists/vocalists and drummer, 45-60 minute set featuring of all the LRB hits. ‘Legend’ is a word suffering from chronic overuse syndrome these days, but when it comes to Jordan Luck, the word regains it’s full meaning and one the NZ public associates with this true blue Kiwi artist. This affection is obviously felt amongst his musical peers as well who bestowed Jordan the honour of Inaugural Inductee into the New Zealand Rock n Roll Hall Of Fame and in 2015, The NZ Music Legacy Award. 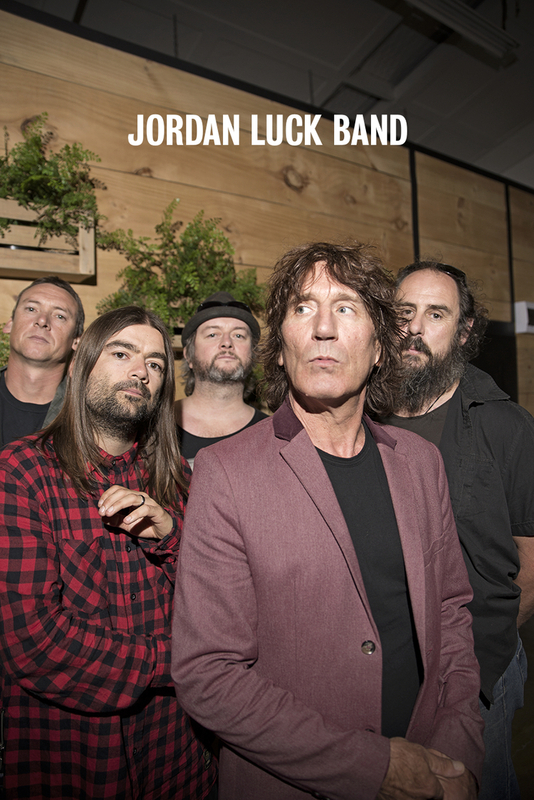 THE JORDAN LUCK BAND is the new super deluxe Frankenstein incarnation backing the iconic kiwi singer these days. Every gig, the band play the best of all those iconic tracks we know and love as well as a collection of recently penned and possible future stadium sing-a-longs of tomorrow. Meticulously designed by Jordan himself from the ground up, this band has just the one purpose...to bring Jordan’s blend of pop rock genius from the past, present and future… back to the masses!